Japan’s One-Way Push Against China: An Unstated Acquiescence? Japan’s recent rhetoric on China has elicited only a muted reaction – but perhaps China wants it that way. Recent Japanese reports depict China in an unusually threatening light: Japan’s Ministry of Defense (MOD) rigorously analyzed Chinese assertive actions in the 2015 Annual White Paper after earlier rejections by Japan’s Liberal Democratic Party for being “too soft on China.” Japan then released an East China Sea (ECS) Unilateral Development Report and even a MOD South China Sea (SCS) Report highlighting the threat of China’s assertive unilateral actions. But as The Diplomat’s Ankit Panda has noted, the Chinese ECS structures are not much of a threat, and the SCS report focuses 15 of 16 pages on China’s destabilizing effects without providing new facts or data (even the red-letter “danger” highlights are reserved for Chinese actions). Instead, these reports seem to be more demonstrative than alarming, which begs the question of why Japan would depict China in this manner as the bilateral relationship begins to turn for the better? The rhetoric creates a much needed boost in public support for the set of bills currently in the Japanese Diet, which formalize collective self-defense and Japan Self-Defense Force (JSDF) deployment overseas. Prime Minister Shinzo Abe needs to follow through on collective self-defense after his Cabinet changed the constitutional interpretation in July 2014 and after assuring the U.S. government that the bills would pass. These measures, however, come at a huge political cost – just 26 percent of Japanese approve of the legislation, with 56 percent opposed – with Abe’s approval rating falling to its lowest level since his second term in office. Thus the reports attempt to regain public approval by warning of future Chinese assertiveness, which increased JSDF capabilities will help to prevent. What could China have done beside the fairly standard remarks? It could have run exercises or stationed military units near the ECS as a warning to the Japanese public and politicians, in a similar way to the current possible preemption of Taiwanese elections. Yet only the August 2015 China-Russia exercises (announced a year ago) are scheduled to take place in the ECS, and these appear to serve more for bilateral cooperation-building rather than signaling. Perhaps China could station oil rigs or platforms across the ECS median line, similar to its island building in contested SCS waters, but thus far the waters look clear (given that signaling would require notifying the Japanese public of these efforts). Instead, the lackluster response carries a number of explanations. First, there could be an ideological contradiction between China’s non-interference stance and intimidation of a foreign government and public. Admittedly, this doesn’t seem likely as China was willing to push the boundaries of stable relations in the past, as in the 2013 air defense identification zone (ADIZ). A second reason could be that China accepts Japan’s need for heightened rhetoric given the contentiousness of the Diet bills, and is willing to allow both the reports and bills without much qualm. This implies an understanding by China that Japan’s actions will not change much after the bills, and that assertive actions will be too costly for preventing what might be perceived as a formality. This further coincides with the aforementioned Xinhua articles, which serve to appease Chinese nationalists while the Chinese government offers a minimal protest but refrains from pushing the issue (for example, mentioning “Japan…overhauling its military and security policies” in the 2015 National Military Strategy). The recent mending of Sino-Japanese relations coincides with this: China still wants an Abe-Xi summit around September, further economic trade, and progress on the ECS Crisis Management Framework, all of which are well worth the temporary image sacrifice to allow Japan to satisfy its short-term legislative goals. This idea leads to the third possibility: concerns over nationalism. Increasingly assertive moves in the ECS will only serve as further evidence for the “aggressive China” image; China therefore wants to avoid further rhetorical ammunition that may spark anti-China moves by Japan. The converse to this is that China itself already has a high level of nationalism over the SCS, which the government seeks to contain to maintain party control and prevent citizen action from going out of control. 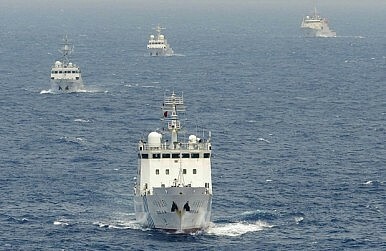 The final possibility is that Sino-Japanese relations including the ECS disputes are no longer China’s priority, and instead the SCS will be its focus in a “Pacific Rebalance with Chinese Characteristics.” Various factors could have caused China to prioritize the SCS over Japan: a larger impetus to secure China’s vulnerable lifeblood of seaborne trade through the SCS while ensuring the success of the Maritime Silk Road, greater uncertainty with the region’s future, too much perceived risk in the Senkaku/Diaoyu islands, prior success keeping ASEAN divided over SCS issues, smaller militaries to counteract China’s actions, and fewer U.S. security commitments to Southeast Asia as compared to the solid U.S.-Japan Security Alliance (although further outreach to Southeast Asian nations may increase America’s presence and stake in the region). If the above is true, Japan’s anti-China rhetoric could be expected to ease following the passage of the defense legislation in the Diet, at which point the two nations may be in a good position to resume relationship building. China’s current acquiescence could be a signal to Japan that Beijing is willing to make concessions for the sake cooperation, with the potential for a positive cycle should Japan reciprocate. In all, contrary to what recent rhetoric might suggest, the Sino-Japanese relationship looks to be strengthening, but with China’s sights on the South China Sea over the long-term, both China and Japan must carefully chart the course of their relationship as both will find challenges in Southeast Asia rather than in their backyards. Justin Chock is a student at Oxford University in the MPhil International Relations program, and is currently a Research Intern at the East West Center in Washington D.C. The views expressed in this article are those of the author and do not necessarily reflect the official policy or position of the Department of the Navy, Department of Defense, the U.S. Government, or the East West Center.